Bristol Gate Capital Partners is a Canadian company that leverages data science and fundamental analysis to construct portfolios with the highest dividend growth. Bristol Gate uses a proprietary methodology to identify, rank, and construct high-performing investment strategies for long-term returns. Bristol Gate’s machine learning expertise peaked my interest, so I spoke with Richard Hamm, executive chairman, to find out how they are using modern machine learning algorithms with an added human touch to outperform traditional, fundamental analysis. Richard Hamm started his career in the 1970s in the brokerage field and eventually landed a job as a business and marketing strategist at a company that became the largest independent mutual fund company in Canada. In 2006, Richard founded Bristol Gate Capital Partners, a company rooted in data science, that provides output relative to the S&P 500. When Richard first got his feet wet in the financial world computers weren’t around, so doing something on a database was next to impossible. Today, a few thousand dollars’ worth of equipment can equal what used to cost millions in the 1990s. Using Richard’s experience in database management at the consumer level, the founders of Bristol Gate decided to create a predictive algorithm based on simple linear regression. The algorithms that Bristol Gate now uses are tree-based with gradient-boosting tech. As Richard explained, the company evolved with the progression of technology and applied data. Richard cited the Dividend Aristocrats, an S&P 500 index, which includes companies that have increased their dividend payouts for 25 consecutive years or more as a good point of reference, but one that lacks forward thinking. 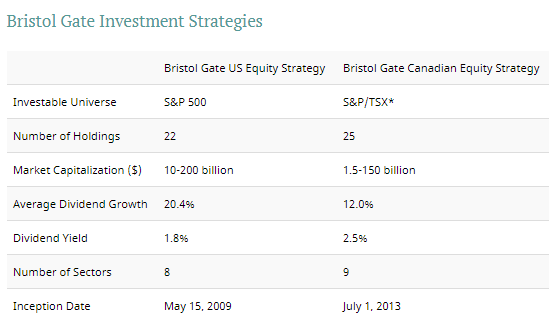 Bristol Gate has two equity strategies: a US equity strategy and a Canadian equity strategy. 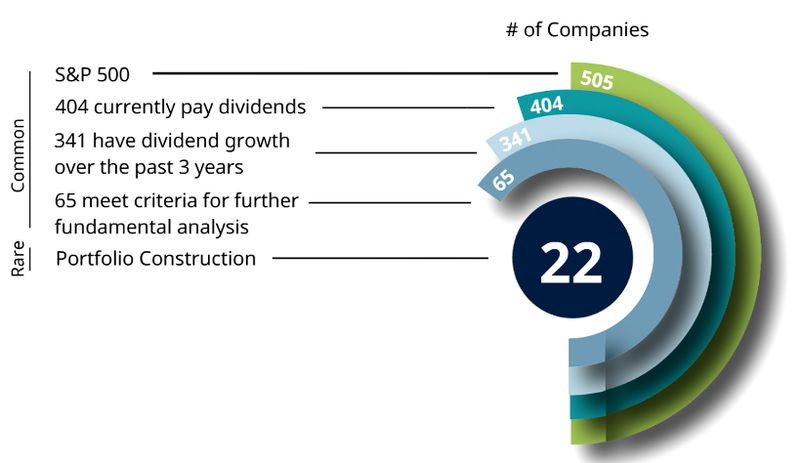 Bristol Gate’s US Equity Strategy identifies large capital investment-grade companies within the S&P 500 universe with the highest expected dividend growth. The process is based on a disciplined machine learning model combined with fundamental analysis, which Bristol Gate calls Productive Capital Analysis. The strategy holds a concentrated portfolio of 22 equally weighted names and does not employ material leverage, derivatives, market timing, or excessive trading. By applying this model, stocks are eliminated if they do not pay dividends, have a limited history of paying dividends, or do not meet a preset annual hurdle rate for dividend growth. Upon receiving a distilled version of possible dividend growers (the “shopping list”), Bristol Gate portfolio managers identify top dividend growers. Select only companies with investment-grade debt (if any). Bristol Gate defines risk as how much the strategy may lose relative to the S&P 500 Total Return Index in periods of index decline and the time period required to fully recover any lost capital. A core belief is that relative risk is mitigated by investing in businesses that possess predictable dividend growth characteristics. Risk management is, therefore, fully integrated into the discipline of the investment process, from the multi-factor model research, to the application of productive capital analysis, to the oversight of the investment committee. Concentration risk. With over 4% on any individual security, Bristol Gate assumes significant idiosyncratic risk. Mitigant: The company does not treat this lightly. Having fewer positions allows them to invest only in their best ideas and pass on ones they don’t believe in. Additionally, their focus on high-quality businesses with strong cash flow profiles and limited financial risk contributes to avoiding failing companies. Finally, the equal-weighting, quarterly-rebalancing approach prevents any given name from becoming a disproportionate part of the portfolio. Benchmark risk. Bristol Gate’s concentrated, sector-agnostic approach leads to portfolios that differ significantly from the benchmark and can result in large performance deviations during shorter periods of time. Mitigant: Bristol Gate believes being different than the benchmark is a prerequisite for beating it. Nevertheless, they strive to construct a well-balanced portfolio when viewed in absolute that is exposed to different risks in a diversified manner. As long as the benchmark remains well-balanced over the long term, performance deviations should be less pronounced. Thesis risk (valuation/quality/growth). The company’s goal is to invest in dividend-growing, high-quality, value-creating companies without overpaying for their stock. Bristol Gate’s stock selection would detract from performance if they misjudged the business’s growth potential, competitive advantages, or intrinsic value. Mitigant: With the company’s concentrated approach, they can be selective before entering a new position. At the same time, they monitor holdings and can exit at any point if they realize the thesis is broken. Since data science is at the core of the methodology that Bristol Gate uses, it’s no surprise that data scientists make up a large part of the team. The data science team works in tandem with the investment managers, and both function as one unit. Both teams report to a single person, the head of the unit, who is an investment manager. Richard, along with Mike Capombassis, president of Bristol Gate, is jointly responsible for marketing and sales, client services, and business management. Most of the tools Bristol Gate uses are open source. After the feature engineering step, the LightGBM Python package is used to model and predict dividend growth. LightGBM is the gradient-boosting framework based on a decision tree algorithm used for regressing, ranking, classification, and many other machine learning tasks. It falls under the umbrella of Microsoft’s Distributed Machine Learning Toolkit project. The model accuracy is then evaluated against a naïve prediction based on the last dividend growth and analyst estimates, which are available through the FactSet database and Bloomberg Terminal. Bristol Gate Capital Partners are maximizing returns for their clients with machine learning technologies. They differ from robo-advisors because they add a human touch in the form of experienced investment analysts and portfolio managers. The results of their work are reflected in the fact that they outperform pure robo-advisors and human analysts on their own. Their approach is cyborg-esque, and many companies today are embracing the hybrid approach to investment strategy.